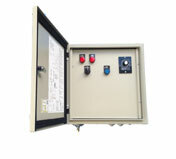 Kenrahn Irrigation Starters have been developed for the rural area and are robust and rated to suit harsh conditions. They are completely weatherproof and pre-wired to save installation time The standard model has a 30 hour irrigation timer and loss of pressure protection which makes it suitable for most applications including Travelling Irrigators, Side Roll, Drip, Fixed Irrigation etc. Kenrahn manufactures many standard and special irrigation starters to suit every application. The standard model has a manual set 30 hour timer for the irrigation run and loss of pressure protection. Simply turn the irrigation timer to the desired operating time and press the start button. At the end of the pre-set time or if the pressure falls during the irrigation time the pump will stop, and not restart until the start button is pushed. The remaining pumping time is displayed on the Irrigation Timer. The standard unit is fitted with a timer which will automatically by-pass the pressure switch during starting and can be wired to enable auto restarting after power interruptions. Flow switch circuit with time delay. High pressure switch and time delay for high pressure protection. Transformer for 24 Volt ac control circuits.